If you exfoliate before shaving will change your shaving experience drastically. Not only is regular gentle exfoliation good for your skin—especially the skin on your face—but it can give you a more productive and comfortable shave. Exfoliation clears the layer of dead skin cells and oils that naturally build up on your skin and has a host of benefits for a healthy complexion and fresh, healthy skin. 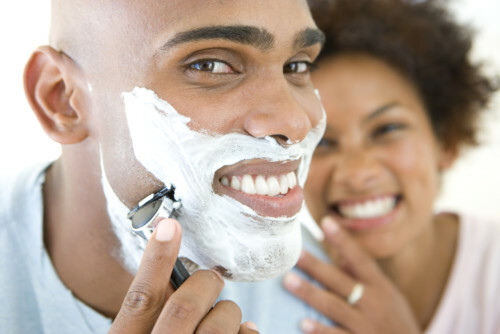 What this means for your shave is that there is one less barrier between your razor and a stunningly close shave. Think of it this way: your razor is gliding over your skin. As it goes, it is clipping the base of hairs where they come out of your skin—it’s not rocket science. But if there is a layer of shed skin cells then your razor has to work double time to get you the close shave that you’re looking for. Regular exfoliation also reduces the chances of ingrown hairs, those painful and unsightly bumps that crop up when hair curls back on itself under your skin.